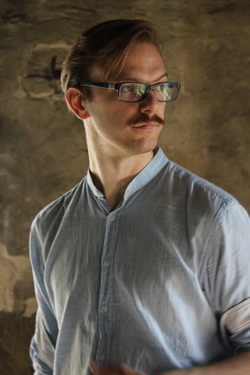 Dan Peter Sundland is a unique electric bass player and composer active in the jazz and improvising scenes in Norway and Berlin. His playing is set apart by his expressive, wide ranging playing techniques, including cello-like bowing and a varied palette of percussive colours. His discography includes compositional work for his own eleven-piece Elevenette, the Berlin based improvising quartet Home Stretch and sideman work with Clara Haberkamp's piano trio, Arne Torvik's fusion band Northwestern sounds and more. Dan Peter was born in Oslo, Norway, 15th July, 1986, and grew up in a village outside Trondheim, Norway called Børsa. He started playing bass at age 14, and studied with bass players Andreas Bergsland and Mattis Kleppen. He attended the jazz department of Sund Folk College 2005-06 and attained a bachelors degree in performing jazz at the jazz department of NTNU Music Institute in Trondheim in 2010.A European Jazz Masters degree (EUJAM) at the jazz department of NTNU Music Institute in Trondheim with exchange to Berlin Jazz Institute (Spring 2012) and Rytmisk Musikkonservatorium in Copenhagen (Fall 2012) followed in 2013. Teachers include Bjørn Alterhaug, Mattis Kleppen, Ole Morten Vågan, Mats Eilertsen, Michael F. Duch and Tor Haugerud. Member of Midt-Norsk Ungdomsstorband (Middle-Norwegian Youth Big Band) 2004-2006. Member of big band S. Møller 2009-2010. Lead Trondheim Improvisation Orchestra together with Peder Simonsen 2009-2010. Received Geir Digernes memorial award in 2012 and Sparebank1 Jazz Talent Award 2013. Nominated for ECHO Jazz Newcomer of the year 2017 with Clara Haberkamp trio. Has been featured with musicians including Jim Black, John Hollenbeck, Axel Dörner, Tobias Delius, Hans Hulbækmo, Hanna Paulsberg, Eirik Hegdal, John Pål Inderberg and Tor Haugerud. Dan Peter Sundland is simply outrageous on the electric bass. Words aren't enough. You have to see him play! Sundland's electric bass is like few others, with lines and tone qualities inspired by acoustic bass players, at the same time as he with great imagination employs the guitar-like possibilities of the electric bass in his orchestral palette.